If you've been following me for awhile, then you know that I am a huge leopard print fan. I always love adding pops of animal print to my outfits. It's so fun and trendy! Although it's fun to incorporate into your outfits, leopard print is sometimes difficult to style depending on the item. Patterned shoes are sometimes tricky. I am a fan of pattern mixing, but sometimes it is too much. I wanted to share with y'all a super easy way to style your leopard print (or really any pattern) shoes! You can never go wrong with the all black outfit with a pop of pattern! I always tend to lean towards an all black look when I want to emphasize a specific piece/pattern. When you look at this outfit, your eyes are automatically drawn to the shoes, am I right?! I Love your cute booties! Such a cute look!! Classic, chic and perfect! You look great. Perfect pop to an all black outfit! I don't own any leopard print, which is crazy. But if I do get something in leopard print, it will probably be cute booties like yours. Leopard booties are so fun or leopard anything for that matter. It's one of my favorite neutrals to style with. Really cute look. Leopard prints are such fun! I love that sweater, too. Second to stripes, leopard is totally my favorite print and this is such a great way to add it into your wardrobe! I would love a pair of fun printed booties! I have been on the hunt for good booties! these are so cute! I love patterned boots!! Those are so so cute. Wondering if I should finally cave and get a pair. Ahh what an adorable look! I love love love the leopard booties. I bought some for fall and have worn them so much into winter. You styled this look PERFECTLY and you look beautiful. I love your leopard booties! The print is so fun! :) Love the way you styled it, it really stands out with an all black look! I'm obsessed with these! So super cute! This outfit is so cute! I definitely agree with you about wearing neutral colors so your statement piece pops & it works so well with this look. 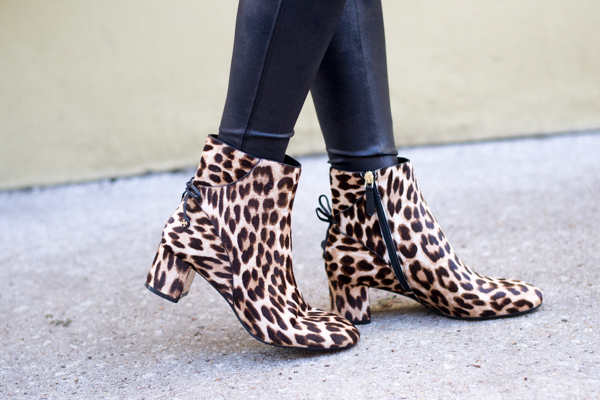 Leopard booties are a must this time of year. Love how you styled yours! Yup, this is so totally cute! 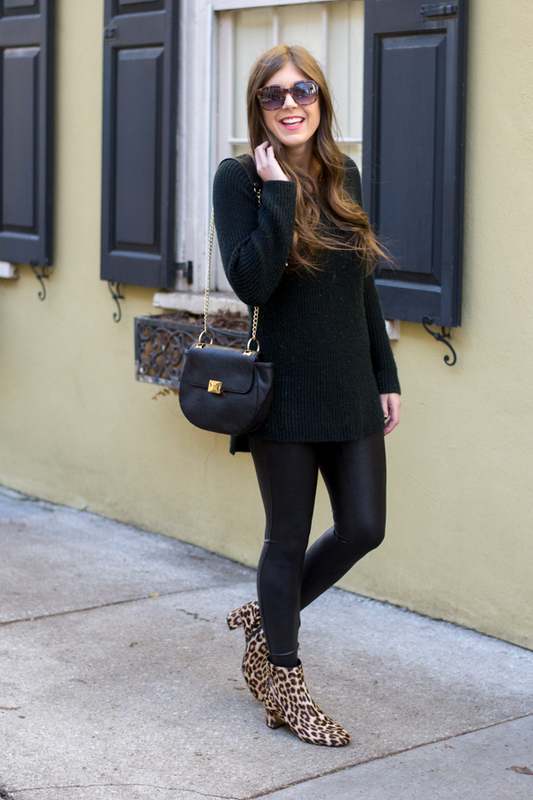 I love a good all-black look, and this proves that leopard can be the neutral or the pop of color. Okay, next fall I HAVE to add some leopard booties to my closet. These are so cute on you!